Native Godox support with Sekonic light meters is something I’ve seen many Godox, Pixapro and Flashpoint users asking about for a long time. It seems that Sekonic has been listening, though, and are finally looking into the possibility of doing it. And I think this idea will make a lot of people very happy. Sekonic has emailed out a questionnaire, which has since been posted several times by recipients to Facebook, in order to get some feedback from users of Godox lights, and its various rebrands around the world, suggesting two possible options for the Sekonic L858D and L-478D light meters. The Sekonic L-308S meter is by far their most popular light meter. Fairly basic but very accurate and affordable, it’s the model that often introduces photographers to light meters. Perhaps they may eventually step up to something fancy like the L-478 or L-858, but the L-308 is usually where they started and the one they recommend to new photographers looking to get their first meter. Now, in the form of the Sekonic L-308X-U, Sekonic have combined the best features of the L-308S for photographers and the L-308DC for filmmakers. The L-308X-U is a single unit designed for the next generation of both photographers and filmmakers. It also includes a couple of new, often requested features, too. Like a backlit LCD and ISO850 setting for modern cinema cameras. The Rototolight Neo 2 seemed to cause a little controversy when it was first announced. The specs on-paper didn’t look all that great. Rotolight were quick to respond and dispute the assertions being made against the Neo 2. Now, it’s out in the wild, and videos are starting to show up to see just how it compares. For example, this one from photographer Luis Gabrial, who compares the Neo 2 with a Godox speedlight. Testing their output side-by-side with the Sekonic L-858 meter. And I have to say, it doesn’t give me much confidence in the Neo 2’s ability. Light meters seem to be a controversial subject these days. On the one side, you’ve got those who swear by them, wouldn’t shoot without them. On the other, you’ve got those that just don’t see the point and consider them a waste of money. They’ll both defend their position to the bitter end. Then you’ve got the rest of us. Those who choose to use them or not, but don’t really care if others do or don’t. Personally, I own one. An old Sekonic L718. Sometimes I use it, and sometimes I don’t. It really all depends on what I’m shooting. For those that aren’t sure how they work, though, or have debated whether it’s worth getting one, have a watch of this video. In it, filmmaker Tom Antos walks us through exactly how they work, and when and why you might use one. Illuminati is a triangle that measures light and color and transmits them to a smartphone. We stopped by the Illuminati booth at Photo Plus Expo 2017, and had a chat with the founder – Mike Okincha. According to Mike, Illuminati will be shipped to backer in a week or so, and available in stores for the holidays with a price tag of $299. It’s said that the truth is often stranger than fiction. I’m not entirely sure about that, although it can be far more hilarious. In this example of a man who’s confident in his words, we have a sports reporter talking about the light levels on the cricket field. It can become difficult see the red ball when it starts to get dark. 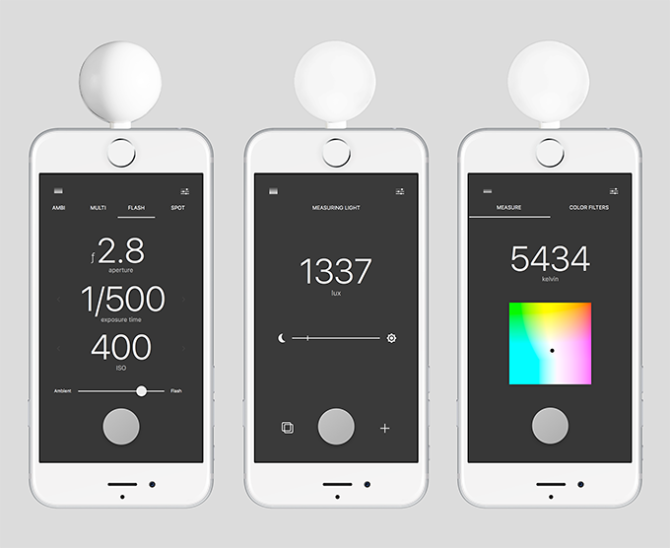 So, light meters are often used to measure the light levels. If it’s below a certain amount, the game is called. To illustrate his point, he pulls out his “light meter” to take a reading and show the viewer. Unfortunately, his “meter” was an iPhone running the calculator app. It showed a “reading” of 6.5, which indicated that it was getting rather dark. 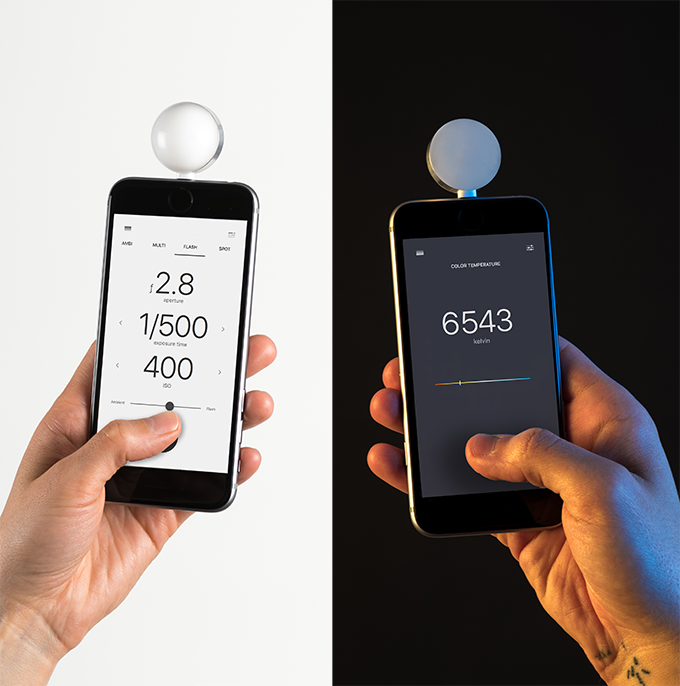 Using a handheld light meter isn’t for everybody, and we occasionally forget to pack a grey card. But there are things that are close enough to middle grey that they can work just as well. Grass is a common subject to meter off in rural areas. But something else you can use is your hand. Using your hand as a target for spot metering isn’t a new idea, but it’s one that many don’t know about. All modern cameras have built in reflective spot meters, and the hand can be a great way to nail a good exposure. As long as it’s in the same lighting conditions as your subject, you’ll be able to get it spot on every time. This video from Sareesh at Wolfcrow shows us how it’s done. Ever since high speed sync was introduced to speedlights, I’ve seen questions about metering it. Up until now, it’s pretty much been impossible to judge with a handheld meter. You basically have to just go off your histogram. Now, that’s all changed. Originally announced at Photokina in September, Sekonic’s L-858D light meter is now getting into peoples hands. Being able to meter high speed sync should start to put an end to the debates over just how much power is lost once you go past your sync speed. It should also make repeatability and consistency much easier. When you’re on location and fighting the sun, you’re often changing shutter speed regularly. While this doesn’t have any effect on flash below sync speed, it does when you get into HSS territory. While it’s completely possible to shoot digital cameras without a handheld meter, they do seem to be back in fashion lately. They provide quick and easy consistency between shots, or completely different lighting setups and environments. They help you get setup and ready to shoot before your subject’s even arrived at the studio or location. They’re also very handy for street photography, too. There’s a lot of options out there, and plenty of digital ones for all budgets. You could go with an old used digital Minolta. Or even something fancy and expensive like the Sekonic L758DR or L478DR. The least expensive meters today tend to be the very old analogue light meters. You can often find them in the used sections of local camera stores and auction sites. But how do you actually use them?